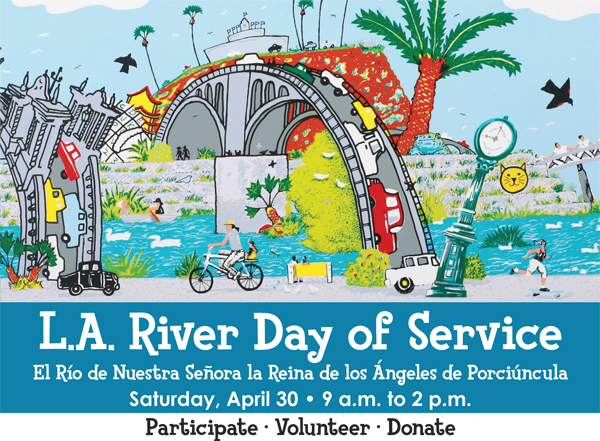 On Saturday, April 30, the Friends of the Los Angeles River (FoLAR), in collaboration with Mayor Antonio R. Villaraigosa, City of Los Angeles, Toyota, and other organizations will host 14 clean-up sites across the city to improve neighborhoods and bankside sites along the 51-mile L.A. River. Toyota South Campus: Two buses will be available to transport Toyota associates on Saturday, April 30, departing at 8:00 a.m. One will return after 12 noon and the other will take interested volunteers to the free Ozomatli concert at Rio de Los Angeles State Park (1900 N. San Fernando Rd., Los Angeles, CA 90065), departing after 2:00 p.m. Boys & Girls Clubs of East Los Angeles: One bus will transport club members and staff on Saturday, April 30, departing at 8:15 a.m. After cleaning the river, it will take everyone over to the free Ozomatli concert at Rio de Los Angeles State Park (1900 N. San Fernando Rd., Los Angeles, CA 90065). STEP 1: Sign up online through Toyota’s Get in Gear site or TFS’ iCARE site for one of the 100 available spots for Toyota at the Bette Davis Picnic Area. When signing up this way, you will also be entered to win an iPAD2! NOTE: If you want to volunteer closer to home, sign up instead at www.folar.org. STEP 2: Download this FoLAR Liability Waiver, then print, sign and bring it with you to the event. STEP 3: Check in at assigned site, get a gift bag (a free FoLAR t-shirt and reusable shopping bag, along with snacks) and begin cleaning up the river and its banks. CHILDREN: 14 years and older can participate. Questions? Call Melissa Richardson Banks of CauseConnect at (213) 446-3467.